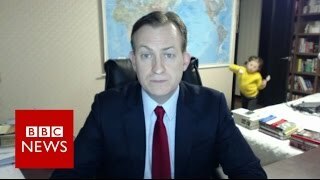 A guest on BBC News unwittingly created the best TV moment of the year when his kids ambushed his live interview. As The Sun reports, Professor Robert Kelly was giving expert advice on the impeachment of South Korean President Park Geun-hye, when his daughter Marion snuck into the room, doing a lively dance. Moments later, her brother James also made an appearance... in his baby walker. If we're honest, we're not sure what's more impressive; the kids' ability to sneak into his study completely undetected, or the mum's slide tackle into the room. Interviewed by BBC Worldwide about all the fame his family received, Kelly said: "We never expected any kind of attention like this at all. We've certainly not had anything in our lives like this before."